A purpose built blast room has been commissioned at Gaspack Services as part of an investment by the company in facilities for restoring and testing cylinders and other containers used to store gases. There is a legal requirement for steel cylinders, such as those used to store calor and refrigerant gases, to be pressure tested every 10 years. Gaspack Services of Pontypridd is a newly-formed company set up to provide this service and to be able to provide the high levels of accreditation required, one of its first investments was for a special blast cleaning facility to clean cylinders inside and out before inspection and as necessary, recoating. Having invited tenders from all leading manufacturers of blast room installations, the proposal from Airblast was accepted and the facility installed. In Gaspack’s case, the central corridor extends two metres outside the front of the room to allow the operators to use a special illuminated vacuum lance. Designed and installed by Airblast, this lance removes all media and debris remaining inside the cylinders – a vital consideration as any media left inside would corrode and jeopardise the integrity of the cylinder. All used media and debris is transferred by bucket elevator to a separator and cleaning system which returns good material to the blast cleaning machine and sends dust, debris and broken down particles to a dust collector for disposal. This ensures optimum blasting performance and ensures the consistent surface finish required. 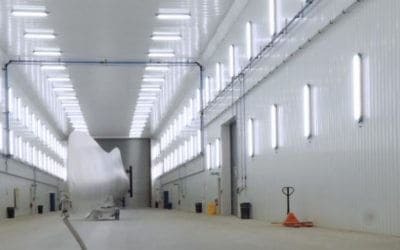 Airblast designs, manufactures and provides a comprehensive range of equipment for surface preparation and coating. These include blast rooms, hand blast cabinets, dust extraction systems, abrasives, paint spray booths, and associated equipment. “We considered other suppliers but most simply offered us a standard or modified standard product. 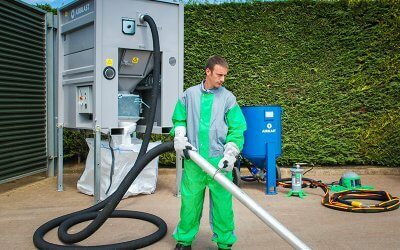 Only Airblast made careful note of what we wanted to achieve then quoted a system tailored to our needs,” said Ben. At 7m long x 4m wide x 3.2m high, the new blast room allows up to six cylinders to be processed in one cycle. These are loaded onto a trolley which carries them on rails into the blast room. The double doors are closed and the operator cleans each cylinder individually. G70 chilled iron grit and a range of special tools and lances are used for cleaning the internal faces of the cylinders, creating an SA2.1/2 surface which allows any defects to be seen clearly during subsequent inspection & testing. High-performance abrasive recovery, dust extraction and ventilation systems in the room give good working conditions for operators while minimising abrasive costs. 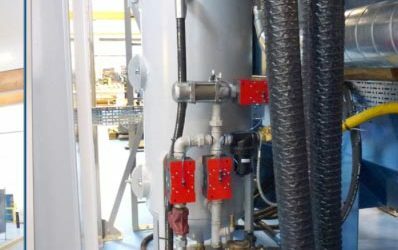 A key feature of the blast room is the Airflex under floor media recovery system which offers many advantages over conventional screw and trough systems – principally high media recovery efficiency, low energy consumption and virtually silent running. It consists of three full length 1200mm wide floor corridors, each covered with heavy duty grating. Each includes a series of scrapers which continually sweep used abrasive on the forward stroke to a transversal corridor.